2015 was hot. Globally, it was the warmest year on record by a large margin. But, there was an El Nino event in the Pacific which probably boosted temperatures slightly (by up to 0.1°C). So, what can we expect for 2016? Using an analogy of similar El Nino events we can make some suggestions. 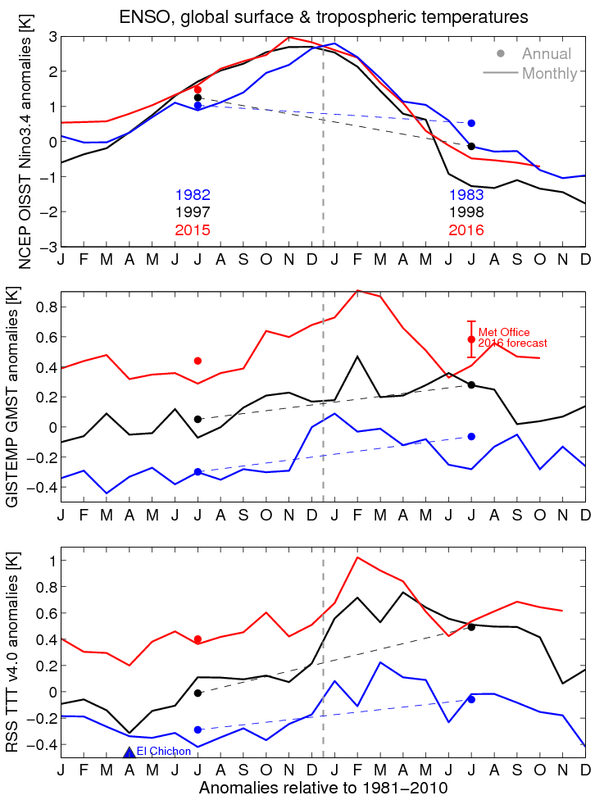 The figure below shows ENSO anomalies (defined using Nino3.4), and variations in global surface air temperature and tropospheric temperatures during 1982-3, 1997-8 and 2015-6. The evolution of ENSO has been very similar in these three periods, peaking between years, and the expectation is for a decline in ENSO for 2016 also. Both 1983 and 1998 ended in La Nina conditions meaning the annual ENSO index was lower than 1982 and 1997 respectively. Naïvely, this might suggest that 2016 would be cooler than 2015. But, what is interesting is that the largest anomalies in global temperature for both the surface and lower troposphere occur later than the largest ENSO anomalies, peaking in boreal spring and summer after the El Nino event. Because of this lagged response to El Nino, 1998 was much warmer than 1997 in both surface and satellite datasets, and the same is true for 1982-3. As an aside – note the global surface temperature increases between 1982, 1997 and 2015 – a clear warming signal of around 0.2°C per decade for similar ENSO states. But what about the satellite data? The response in the troposphere was larger than at the surface in 1997-8. This is also true to a lesser extent in 1982-3, but the eruption of El Chichon in April 1982 complicates matters. It will certainly be interesting to watch how the troposphere changes during 2016. So, if 2016 follows a similar pattern to 1983 and 1998, then it will be much warmer at the surface than the already record year of 2015. The Met Office 2016 annual forecast seems to suggest this, expecting a similar (but perhaps slightly smaller) jump to that seen from 1982 to 1983 and from 1997 to 1998. The TLT El Niño pattern is very interesting. The satellite does not see the warm SST, nor does it register the upper tropospheric warming due to the extra rainfall along the equator. What it does see is, a few months later, the warm air being advected with the Hadley Circulation downwards to the north and south. This explains why the El Niño warming is later than in the surface datasets, and stronger. See the most recent map. I do not have a vertical cross section of the El Niño heating yet, would appreciate it if someone could make it. Thanks Geert Jan – the spatial structure of the TLT response is indeed interesting. Geert, your excellent points are being borne out by the reanalysis data as we approach the half way mark for 2016. You have an, albeit, unlikely ally in Joe Bastardi who in fairness predicted “a field day for the heat” months ago for the current year, based on the ENSO modelling and past history of ENSO events. Whether this comes to pass when we transition to a widely forecast La Nina is “up for grabs”. We may afterall still move to a higher rung on the ladder of rising GMST., which will depend on the depth of the ensuing La Nina. Let’s hope no volcanoes will cloud the skies in figuring this. Thanks – for that statement I was discussing the annual average – the slope of the dashed black and blue lines are slightly steeper in RSS than in HadCRUT. Clearly so in 1997-8, but less clear in 1982-3. But, not clear how much the volcano affected the changes. Here goes; 2016 will be similar for for GMST as 2015 despite a rapidly decaying El Nino the Pacific will still be returning heat to the atmosphere until the switch to La Nina late 2016. Using the JAMSTEC, which is well regarded in the meteorological community AFAIK, we have an evolving La Nina PLUS a cold AMO signature going into 2017. So a peak of GMST for both 2015/2016( given error bars) followed by a plunge in 2017, maybe back to the early satellite record. JAMSTEC WITH MAJOR AMO CLIMATE BOMB! continues cold AMO AND destroys WATL warm pool PAC SST argues cold 15-16 winter! _Joe B. In the 2015 half of the 2015-2016 winter, the North Atlantic featured both a cold blue blob and a persistent upward trend in the AMO index. Well, it looks like January will exceed December’s record, but not by a huge amount. I think people who are expecting the 2016 portion of the 15-16 El Nino to deliver astoundingly high anomalies going forward are going to be disappointed. 2015 has set a very very high bar. I’m expecting 2016 to be the 2nd warmest year in the instrument record with an anomaly of around the .80C-to- .85C range on GISS. Always thinking long term, here’s to hoping I eat crow when February blows through 1.25C on GISS.